Believed dead following a battle against Annihilus in the Negative Zone, Johnny Storm was recently revealed to be alive and well, and has resumed his position with the Fantastic Four. Well that certainly dates this set to a specific point in time, doesn't it? Johnny's "death" is what prompted Reed to form the Future Foundation (although that group continued even after he came back). 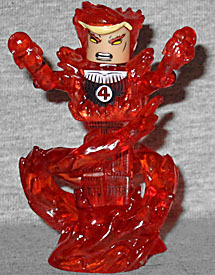 Getting a Human Torch in mid-"Flame On" is nothing new, but this one is very nice. He's done all in translucent orange, but is painted with vertical lines on his arms and legs and a little bit of blue costume on his chest. He has new hands and feet, molded with flames on them, and a new fire frame to go over his shoulders. There's also a large base of swirling flames that wraps up around his legs. Johnny has two heads. The one he's wearing in the package has yellow eyes and GREAT FLAMING EYEBROWS. The hair is fiery - if it were painted black, it could pass for Wolverine hair. The alternate head is calmer, with a fully human face, and a new blonde hair piece that comes down just a little too low below the edge of the head. 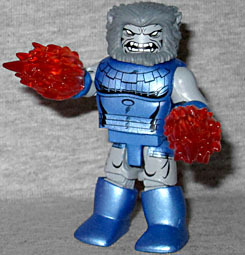 Blastaar is nicknamed "the Living Bomb-Burst" because he can fire concussive blasts from his hands. An enemy of Annihilus, he onced ruled his own kingdom in the Negative Zone. Blastaar was created by Jack Kirby in May of 1967 - just three months after he created Ulik the troll, which may explain why one just looks like a palette swap of the other (to say nothing of the fact that Ulik and Kalibak look exactly alike). Blastaar is a large brute of a character, so he gets a lot of the bulky add-on pieces: boots, thighs, waist, hands, biceps, and chest. His costume is metallic blue, contrasting with his gray skin. His chest is painted with armored scales and anatomical shadows, and his bushy hair/beard combo are a single new mold. To show his blasty powers, he comes with two trans orange energy effects that fit over his hands.